Sun is always fun. After a long winter and women waiting to get into their sun dresses, here we go. Sun is out and it’s time for summer. It’s time to start planning your summer beach wardrobe. 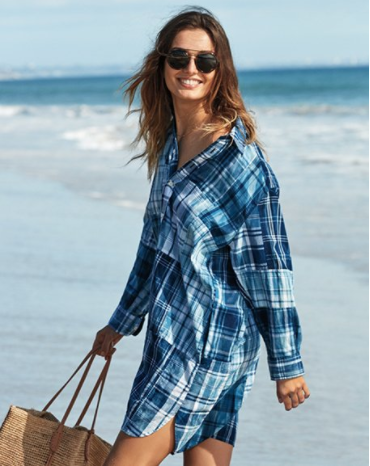 Whether it’s a beach vacation, a date on the beach or just a lazy evening spent on the beach, summer is incomplete without a perfect beach dress. So let’s go a put together a cute perfect beach outfit. Identifying the occasion for which you want to suit up in a beach dress is a must. Are you going out with a date on the beach? Are you going with friends for a casual beach play? Are you going out on a beach business event? or Are you going on a special occasion on a beach? Getting answers to these questions will help you choose your perfect beach dress. If you are lucky to be invited to a business party on the beach “how cool is that” then make sure to have a combination of busineessy & beachy looks. Get into a deep low cut top of any dark color and a lighter color pants. Sometimes even creative ways like your hubby’s shirt and a short makes your look trendy for a beach business party I tried this ones and it was a huge hit. Beach dates are often the best. If you get a rich date with a luxury yacht then beach dates are the best Be sure to dress up in a flowery dress with low cuts. Give an impression of a normal date mixed with the sunny beachy flavor. When you add the combination of two and make a cocktail then the dates are often the best.